Cedarville junior post player Ruby Stack (34) goes in for an inside shot attempt, during the Division IV sectional semifinal game against Lockland, Feb. 22 in Monroe. Cedarville won the game, 50-21. Indians senior Ise Bolender sets up for a three-point shot attempt in the first half of Thursday’s 50-21 win over Lockland, in the Division IV sectional semifinal game at Monroe High. Bolender led all scorers with 19 points. Senior Sami Beuttell (12) scrambles after a loose ball as teammates Maggie Coe (30) and Ise Bolender (14) head upcourt after the turnover, during the sectional semifinal tournament game with Lockland, Feb. 22 at Monroe High. Cedarville reserve player Maddie Kinney (50) puts up a shot during the second half of a Division IV sectional semifinal game with Lockland at Monroe High School. 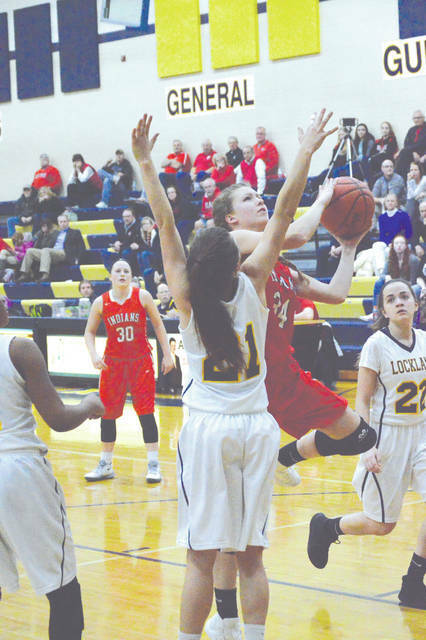 Cedarville reserve Lauren Whitaker (44) drives around Iyann Cunningham of Lockland, in the second half of Thursday’s 50-21 Indians win at Monroe High. Junior Caylee Cyphers (24) of Cedarville puts up a rebound for a score in the second half of a 50-21 girls high school basketball tournament game win over Lockland, Feb. 22 in Monroe. 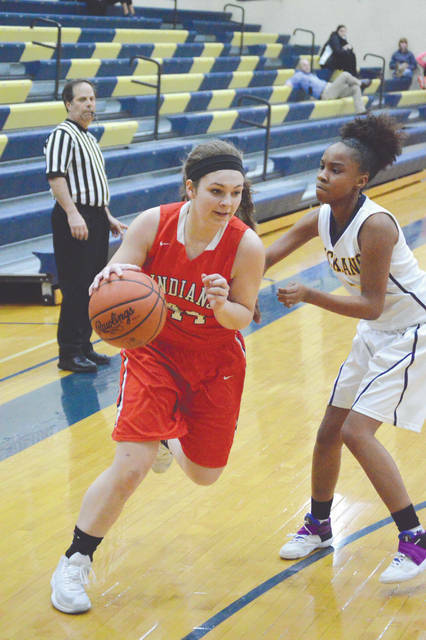 MONROE — Everybody on the second-seeded Cedarville High School girls basketball team that could spend time on the court, did, as the Indians rolled to a 50-21 win over No. 10 seed Lockland in the Division IV sectional semifinals, Feb. 22 at Monroe High School. The heavily favored Indians (19-5) led the out-manned Panthers 32-0 after one quarter of play, and maintained at least a 29-point lead the rest of the way. Indians coach Josh Mason methodically platooned the 13 Cedarville players on his roster. According to the official scorebook, each Indians player saw three quarters of action. “The biggest thing we’re looking for right now is, we just wanna keep playing,” Mason said. “No matter who we’re playing, our girls are coming out with the right amount of energy to get the job done. They understand that in the postseason like this, you lose and you don’t get to come back to the gym together. Ise Bolender led everybody in scoring with 19 points, 18 of which came in the first half. 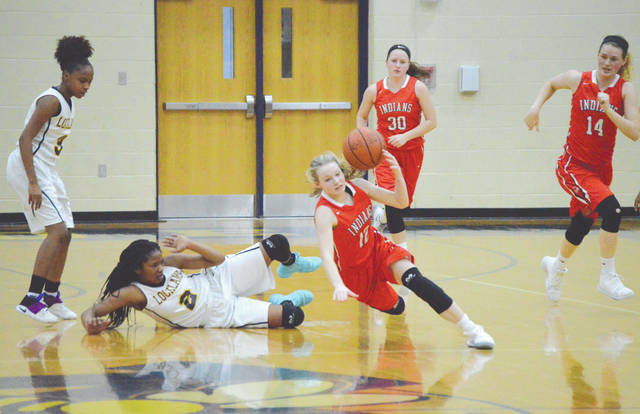 Celeste Rucker scored nine points for the Indians, Maggie and Elly Coe scored eight each, Kayla Cyphers scored four points, and Lauren Whitaker added two in the Indians win. Similar to the 50-10 first-round win over Middletown Christian, the Cedarville starters enjoyed cheering on their teammates from courtside for a good portion of Thursday’s contest as well. “We’re feeling pretty good now. To get the two wins is great. 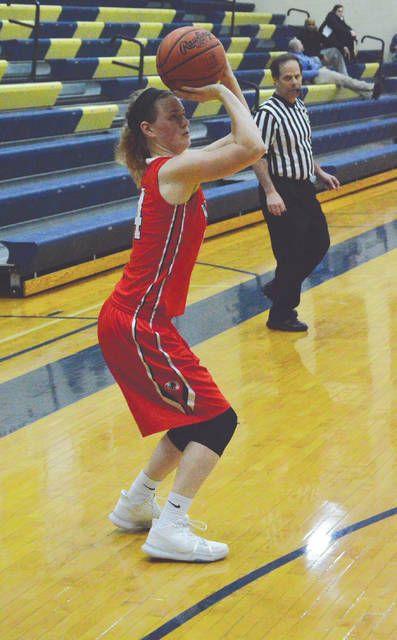 We’re just all focusing on making sure that we’re getting better, and overcoming any of the weaknesses that we had during the regular season,” Bolender said. Maggie Coe said the team is like a big family. “My teammates are my best friends, and we all get along really well. It’s great to see them doing well on the court, too,” she said. 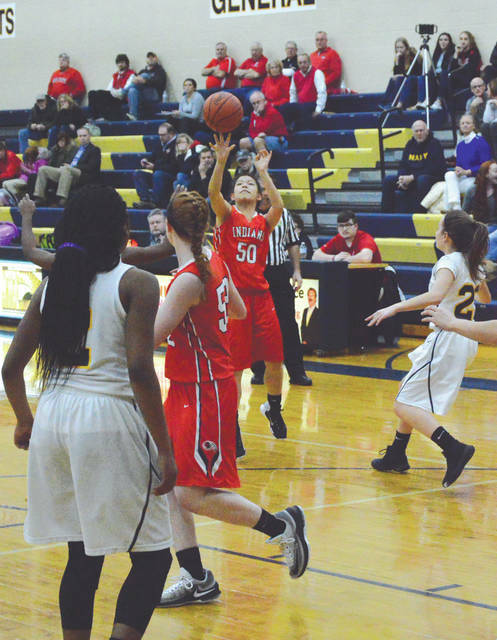 The Ohio High School Athletic Association rules allow for a running clock once the scoring margin reaches 35 points or more, but it doesn’t take effect until the second half of play. By halftime, the Indians were in front of the Panthers, 43-6. With the constantly running clock in the second half, Lockland (3-20) outscored the Indians by a 15-7 margin. 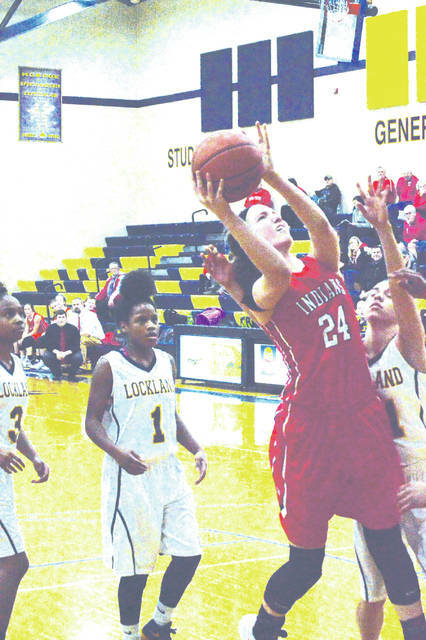 Senior guard Erin Goins led Lockland with 10 points scored, senior Heather Gehring closed out her scholastic basketball career with six points, while Iyann Cunningham, Tia Costanzo and Ashariah Eubanks combined to score the team’s other five. Cedarville will take on the winner of Thursday night’s sectional semifinal between No. 7 seed South Charleston Southeastern and third-seeded Cincinnati Christian. “No matter who we play, we’ve gotta run our plays better than theirs. We’ll watch a little bit of their game, to see what we need to work on, but making sure we’re doing our own stuff is most important,” Bolender said. Cedarville defeated Southeastern twice in Ohio Heritage Conference games during the regular season. “Either team is going to be a challenge. We know about Southeastern from playing them twice in the regular season, and Cincinnati Christian is the No. 3 seed. It’ll be a good game either way, I think. We’re excited,” added Coe. The Division IV Monroe 2 sectional final game will take place at 7:30 p.m. Monday, Feb. 26. In that day’s early game at 6 p.m., top-seeded Xenia Legacy Christian will take on No. 4 seed Fayetteville Perry. Both games are at Monroe High.